If you haven’t really considered the water pump to get for your tank, then you are probably researching about pumps. Since you are reading this article you are probably also wondering what a submersible pump is? This article will clearly explain what a submersible pump is and when it is used enabling you to decide whether they are for you. Submersible pumps as the name suggests are made to be fully submerged in water. It is a centrifugal water pump, meaning it has a motor that powers an impeller designed to rotate and push water outwards. The motor is located within a waterproof seal and closely coupled to the body of the pump which it powers. Pumps that are designed to be submersible are placed within the reservoir of water that needs pumping out. As such, they are often used for drainage in floods, sewerage pumping, emptying ponds or even as pond filters. Filtration pumps found inside fish tanks are a type of submersible pump. In the case of a water tank, submersible pumps are placed inside the actual tank to pump the water out to where it is needed. A major advantage to submersible pumps are that they are very quiet since the water absorbs the noise. They are also more efficient since they don’t need a lot energy sucking in the water that they are submerged within. Disadvantages include the seal corroding over time allowing water to get into the motor and the seal making motor access and repairs more difficult. Submersible tank pumps are seated in the bottom of your tank and designed to pump water upwards through the top of the roof. Given this, they are generally used in underground tanks where water needs to be pumped up to the surface. This is especially important to consider if you will be installing in an above ground tank. 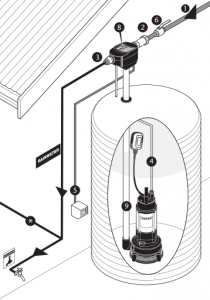 Submersible pumps can be installed in above ground tanks, however you need to keep in mind that your rainwater will be plumbed in from the top. If you also want to directly access water from your tank, a tap can still be fitted to your tank, or you might simply opt to connect your rainwater to nearby taps. A downside to having submersible pumps inside your water tank is with accessibility should maintenance or a replacement be necessary. They also consume a small amount of space inside your tank meaning a few litres less water, but compared to their invisibility and quietness such is quite negligible.